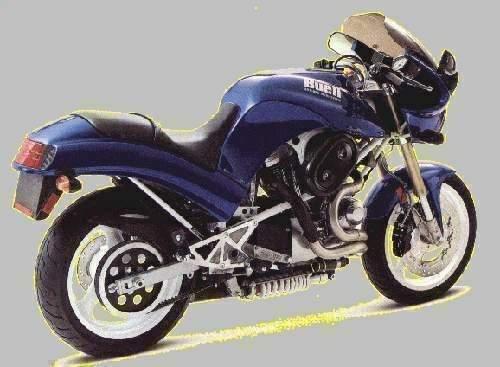 Rear Wheel Travel 116 mm / 4.6"
In 1993 Harley-Davidson became almost-half owner of the Buell Motorcycle Company. Milwaukee, in a refreshing bit of candor, admitted its specialized factory sport bikes had achieved little success. Better to assist someone well-suited to the design, chassis and assembly requirements of those machines, with Harley-Davidson acting only as the engine supplier. The timing was right. 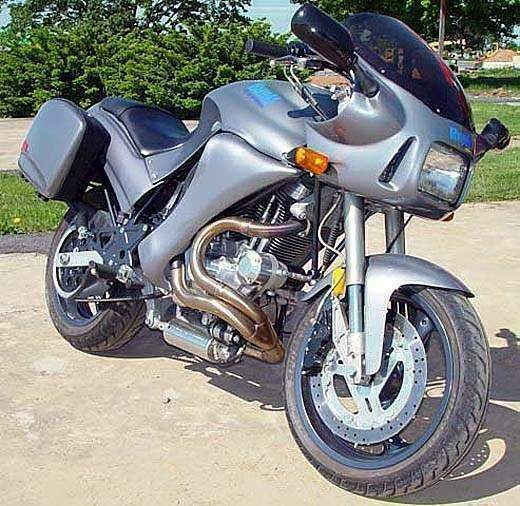 Buell was under-capitalized, Harley needed a sport bike and an investment opportunity. In 1994 the Thunderbolt was the first product of the new partnership between Milwaukee and MukWonago. The chassis' wheel-base and steering geometry were unchanged, but the new design left more of both the engine and frame visible. The riding position became something of a compromise between the racer's crouch and the cruiser's slouch. for torque. The curb weight is 481 pounds (218kg). The production schedule was set for 300 Thunderbolts in its debut year. In 1996 the S2T was introduced with color coordinated saddlebags and fairing lowers, with touring handlebars and footpegs. Another example of Harley-Davidson's support showed in the prices; the S2 listed for $11,995 and the touring model for $12,795, well in line with the competition.